One of the best bands in the County/Rock genre at the moment returned to the UK for a two date headline tour and a slot at Planet Rock Festival after a highly successful trip to C2C Festival earlier in the year. The first date of their tour began at London’s O2 Islington. 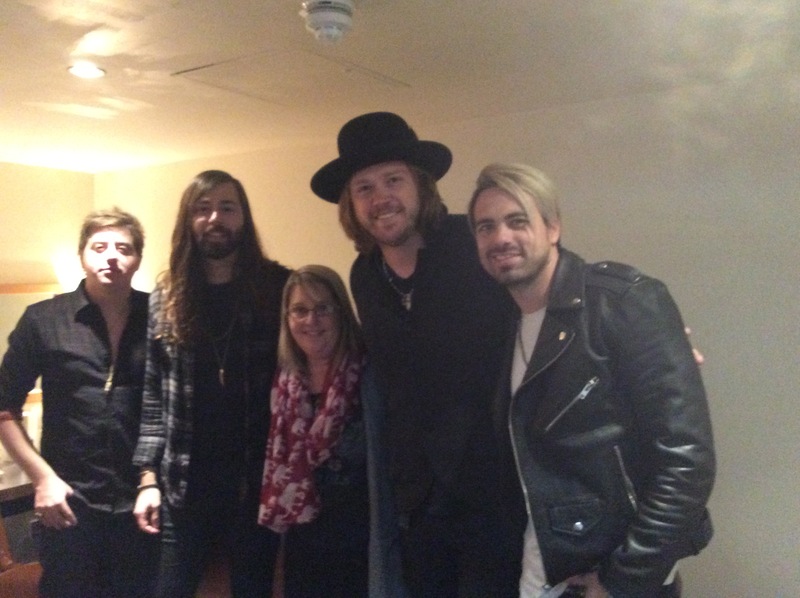 I caught up with the band just before their gig for a quick chat. All the band members were humble, friendly and witty and made me feel right at ease. Hope you enjoy our chat. Welcome back, it’s lovely to have you here again. ATH – Thank you, we’re happy to be here. You played C2C festival earlier this year -was that your first trip to the UK? How was that experience for you and how did you find the UK audience? Michael – C2C? Yeah, first trip. We had no idea what to expect, they kind of just told us we were coming over here and we were really excited as it was our first trip, none of us had ever been. Then to see the response of the audience at C2C and the crowds that came, we were kind of really blown away, so we couldn’t wait to get back. That’s why we are here. You also played a headline show a few days after the festival – how did the crowds differ, because you also get a lot of air time on Rock radio here, so I’d imagine there were a lot of Rock fans and not necessarily just Country fans in the audience? Graham – Yeah seems like we do, yeah. Michael – Yeah, seems like over here that is our identity, you know? I mean we are a Rock band and a Country band. I mean it’s all just about what comes out of us from all our influences, but we definitely know we are a little more aggressive on the Country side than most people. 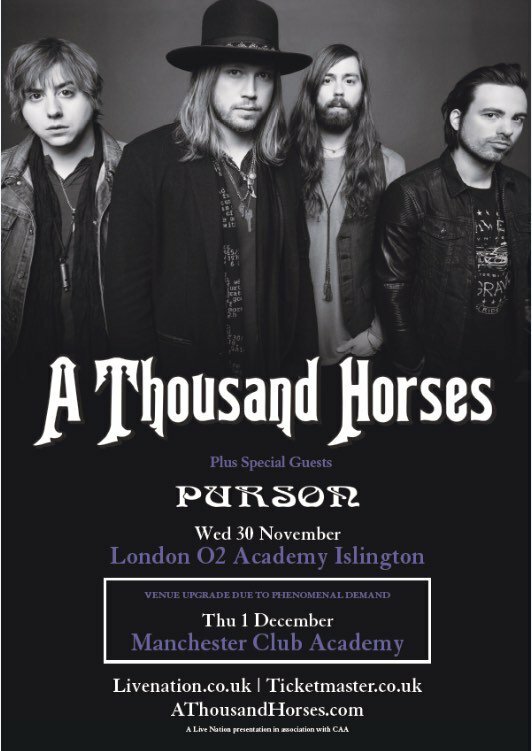 I think that’s what kind of makes us unique and special with what we do – and what A Thousand Horses is, because nobody else really does that. So, for us, yeah, it’s a Rock-Country influence. All our favourite bands are rock and roll bands – but my first concert was Alan Jackson, I grew up listening to Country like crazy and Zach’s first concert was Dixie Chicks. Graham – Well, Rolling Stones wrote a Country song. Michael – Yeah, exactly. They wanted to be a Country band, ha! Well you are a combination of two of my favourite genres, so I am happy. Zach – Well, we are glad you like it. I guess you would call it Southern Rock right? Michael – Yeah, I guess so – that seems to be what people label it. You know between Lynyrd Skynyrd and Tom Petty – if he came out today he would be a Country guy, you know? Graham – I think The Eagles would be a Country band. Bill – There were, they were a Country band. Well, I would say even Fleetwood Mac have a strong element of Country. It’s hard to really label anyone genre-wise these days. I hear so many different genres in so many songs, I Was listening to a Pearl Jam song the other day and thought how it would make a great country song and then Miranda Lambert has a song on her new album that I can hear being cut by The Distillers. Graham and Michael – That’s cool. Bill – Country is all about the song, you know; it’s the songwriting, so I think we’re a band that focuses on songs and lyrics and stories – there you go, haha! It’s all part of being Country. Are you going to make a regular visit to the UK now? Are we going to see you a lot more? Michael –Yeah, that’s the plan. The plan is to come back every year, twice a year and just kind of build it out little by little and then do a big headlining tour – as we are only doing a few shows this trip. That’s the idea man, that’s the goal. You have had a couple of EP’s out but Southernality is your first studio album. 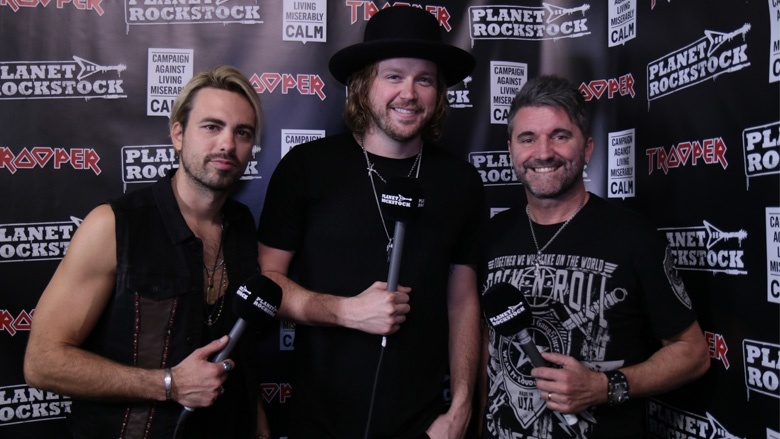 We just touched on earlier how it is a cross between Country and Rock, so how has the reception been within the Country genre – has it had a lot of good response on Country radio? Michael – Country radio has been great for us over in the US. You know, we had a Number One over there and a Top 20 – a couple of hits, so they have definitely accepted us. Then over here, with the radio that have played us, it’s been killer, like you said, on the Rock side, so it’s been a cool thing to see with the Country music as well. Kind of what you said earlier, just fans of music and it really doesn’t matter where you get it from or who plays it, it’s just kind of out there. We are a dedicated fan base, we love the music and we love the words. For me in particular, I don’t stick to one genre. What is your view on Country radio? Would you say it is essential for Country radio to play an artist? I look at artists such as Kip Moore who never gets played, but still has a cult following and I feel whether you get played or not, your fan base will always be huge and always continue to grow. Zach – It helps, for sure. Michael – It’s hard to do it without Country radio for sure. I think Country radio is super Important in the States and it’s helped us a ton. It’s changed our lives as far as exposure and making fans, selling records & tickets are concerned – that’s been the cool part about it. Zach– I think it’s like anything that can get your music out, people will hear your stuff – and then the great ones keep going even if not played anymore. That’s why Kip Moore continues to go and like Eric Church, he has kinda been, he’s walked that line with Country radio – but he is just so awesome that people just keep coming to his shows more and more every time. 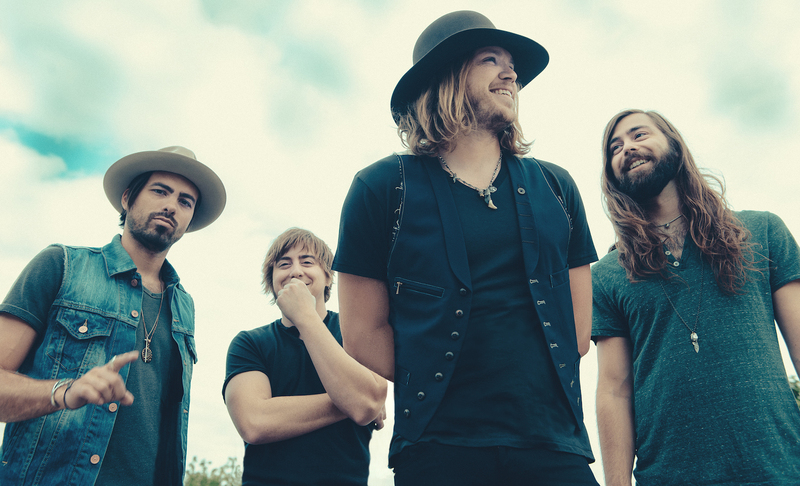 It’s one of those things that is hard for us as UK Country fans to tell here because we don’t have Country radio stations – apart from the online independent ones – so most of us literally rely heavily on each other for word of mouth. Zach – Yeah, we love that about it over here. C2C for example is a massive stepping stone for us to discover artists such as yourselves and I for one will always be grateful for that. I hope you come back for C2C next year – are you? Zach – I hope so, I don’t know. You are signed to one of the biggest labels around at the moment, Big Machine Label Group – I mean it’s almost the biggest label in the world now. Zach – Haha, it’s getting there, huh? How did that signing come about? Did you struggle with getting recognition from labels at first, or were you in the right place at the right time? I know CEO Scott Borchetta goes to a lot of shows, scouting. 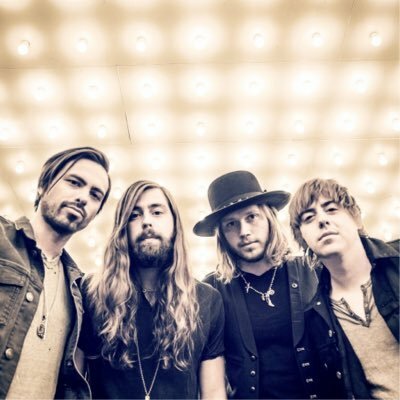 Zach – You know with Southernality, we were working with Dave Cobb who produced it and we had management and a booking agent. We didn’t have a label, so we decided that we were going to just put an album out on our own, because we had a bunch of songs that we thought were awesome. Bill – Yeah, and we were gaining fans too and we were on tour with Kip Moore at the time. Michael – Yeah, we were. Bill – Yeah, he heard a few songs we were making and got us our first record deal. It’s kind of funny because before that happened we were all out at the parking lot of the studio trying to get credit card companies to try and put the record out. Michael – You know -and thank god we didn’t, because it paid off and Jimmy heard it before we could ever get it out and signed us to Big Machine. Then we went in again and pretty much tweaked that record and it’s lucky we did, because that’s where Smoke came from and a few other songs on the album. It was a pretty wild thing but we bet on ourselves and it ended up working out pretty well. It seems to be the way to go – lots of people seem to be releasing their album independently first and then get picked up by a label and having the album re issued. Zach – You have to be willing to do that you know? You can’t just wait for a label. We didn’t wanna go around shopping for one. Bill – Yeah, we figured that once you get a label deal, it’s all just part of trying to move forward as an artist or a band. You have to create and put stuff out for the people. Well I am glad they are a label that let you stay true to who you are as artists. Michael – Totally, yeah they are great about that and supporting – letting you be you. They’re more guiding you than telling you what you can or cannot do. Well, as a fan, you can tell you know? You can tell when an artist has been pushed to their limit or pushed towards a direction they didn’t choose. Michael – Like sing some sh** they don’t wanna sing? Haha! Yeah, exactly ha! It doesn’t always translate well in a live show either. Michael – Yeah, exactly. The fans know, the audience knows- you have got to be honest with them. Back To Me is one of my favourite tracks – can you tell us the inspiration behind the song? Michael – We wrote that song in like 45 minutes. It was us three and then another buddy of our’s – Weston – who wrote a lot of songs that Kip Moore sung. He is Kip’s best friend and yeah, it’s kind of just that story of a small town girl that needed to leave. You know, she kind of holds the man’s heart and if she would just come back home to him then everything would be ok and he would take care of everything. So, it’s kind of just like that love story of someone wanting to get out, but eventually they just come back home. Will you be playing it tonight? Michael – I dunno, you have to wait and see! So, you are working on a new album – what can we expect from it, and when you are putting an album together, do you try to put songs on there that will translate well in a live performance? Ones that you know will create a great live atmosphere, not just a song that you play live, but one that gets the crowd going? Bill – I think we always think about that. Bill – The first album, Southernality, was a collection of songs that we had and as we were making it, it came together naturally, so I think the next one we one working on will hopefully be the same. Will you be playing any new stuff tonight? Michael – We will be playing new songs, yes. You are playing Planet Rockstock on Friday. I believe that is a Rock festival in Wales. Have you ever been to Wales before and will you try and catch any of the other artists’ sets? ATH – Yeah, it’s going to be awesome! Zach – Honestly, we have never seen any of the people who are playing, so we are excited to check it out. Planet Rockstock are one of the first to start playing our single over here, so we are excited to get over there and meet them too. Zach – No, it’s our first time. We are excited. Michael–It’s the first time we have gone outside of London, last time we were here just for London. Well you will have an amazing time. Thanks so much for talking to me today. ATH – No, thank you! I am so excited about tonight! ATH – Enjoy the show!